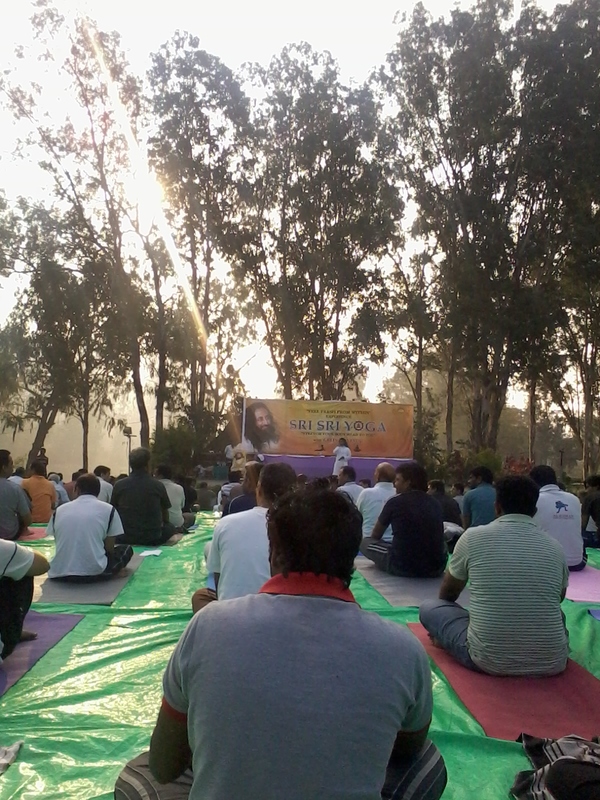 Sri Sri Yoga camp at Botanical Gardens, Hyderabad. A knock on the door. “Would you like to come for a 4-day Sri Sri Yoga camp organized by the Art of Living foundation?” an uncle in the flat next to mine asks. 4 days? I can manage 2. I drag myself out of bed on Friday morning at 5 am. The camp is scheduled 6-8 am in the beautiful Botanical Gardens nearby. 200+ people turn up. Many of them my age. Wow. I wasn’t aware people were so much into yoga these days. The instructor Girin Govindji climbs on the stage and begins the session. I am a little sceptical that this would turn out into a religious discourse. But I am pleasantly surprised. Our instructor first takes us through a series of body loosening and stretching exercises. Also referred to as Sukshma yoga (literal translation – “subtle” yoga). Followed by some basic Asanas. Girin Govindji gently pushes us into doing previously unimaginable and improbable postures. All of us break into a laugh as we groan doing what he does with complete ease. He makes a good point – Yoga is not punishment, it is something joyful. If you are not enjoying it, you are not doing it correctly. Then Nadi Shodhan Pranayam or channel cleansing Pranayam. Breathe out and in from 1 nostril. Repeat with the other. 7 cycles of each. Finally, meditation. Sit and observe the breath. Classical music plays softly in the background. The mild winter sun rising on the lake beyond, through the fog. Googling later, I learn that Girin Govind is Sri Sri Ravi Shankar‘s secretary, the spiritual Guru who established the Art of Living Foundation. 3 decades old, this organization is the largest of its type, with branches in 150+ countries. Unfortunately for me, this yoga camp wouldn’t be teaching Sudarshan Kriya, Sri Sri Ravi Shankar’s famed breathing technique. That will have to wait for another day and another session. Previous Post A year down and thank you! I used this as a guest blog on my Emotional Fitness Blog. So glad we are friends. There is an on going Event in India ,International Festival at Rishikesh which promises a better then ever Yoga Festival grounded in the authentic orgin of yoga exploring eight limbs of Yoga and how they apply to our lives. Insightful and sensitive as usual! Very nicely written! Made me smile.